Hamby Home(in)stead ...: Watch and Act (then watch the acting-up)! Watch and Act (then watch the acting-up)! It's been an exciting day at Hamby Home(in)stead. Far too exciting - hopefully tomorrow will be much quieter. Yesterday was stinking hot and windy. 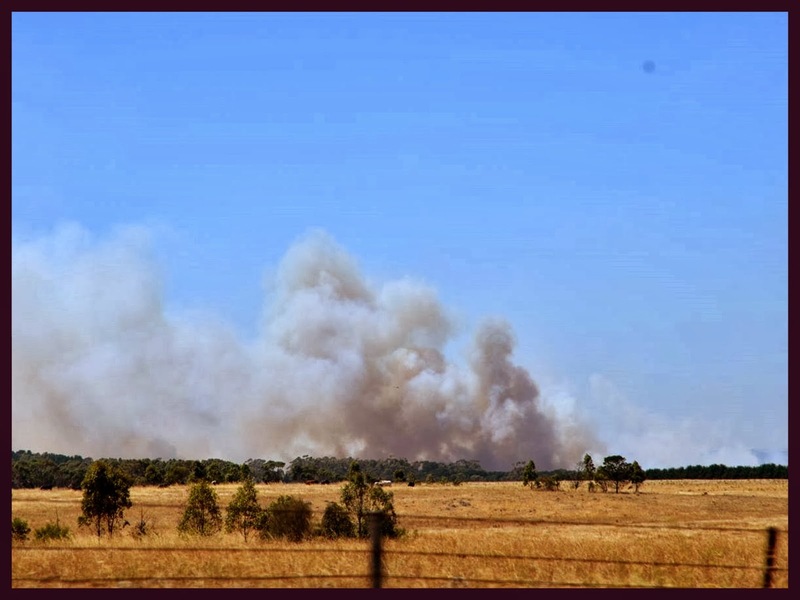 The conditions were likened to those that had preceded the Black Saturday fires of 2009. We had been out for the afternoon and saw the smoke and fires when returning home. I was woken this morning by my bedroom smoke alarm. Once up, I checked the CFA updates via FaceBook and then the Victorian Emergency website. Our area was listed as "watch and act". School was operating as normal and I stayed for the assembly, particularly to hear details of the emergency evacuation plan. It all seemed straight-forward, so I headed home (after advising the Principal that Vaughan would be leaving at lunchtime due to a dental appointment). During the morning I kept checking the location of nearby fires. Nick had been on night-shift and when he woke, I showed him how close some were. Erin and I had already been packing bags of clothes and personal items - and we decided to take them in the car with us when leaving for Vaughan's appointment. After we finished at the dentist, Erin advised that our area had been upgraded to an emergency warning. We spent some time at our favourite café while we pondered the situation. Nick called our landlady (also a CFA representative) who advised it was OK to come home. I had put a curry into one of my thermal-cookers this morning. 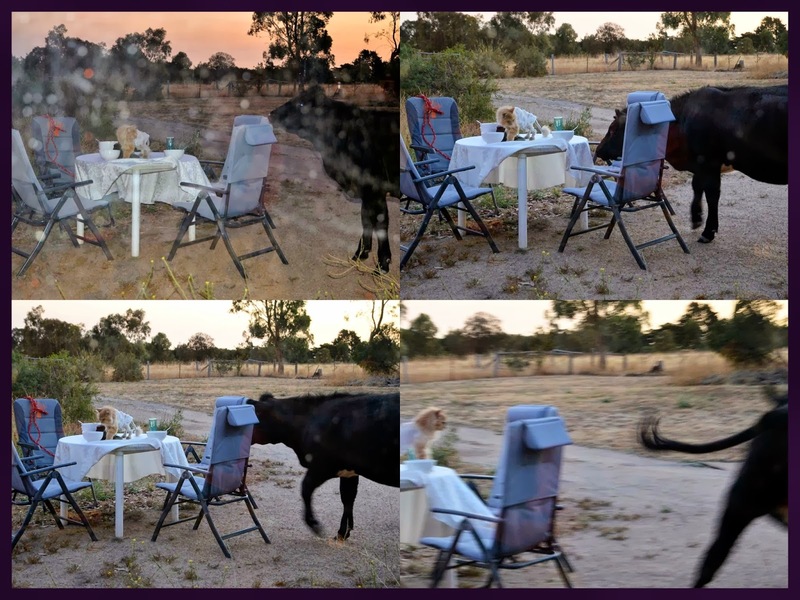 We were enjoying it al fresco when I heard a funny noise. Moments afterward Erin cried "cow in the house" and we all sprang to our feet to oust the intruder! I managed a couple of quick shots through the window before the horrible heifer was expelled! 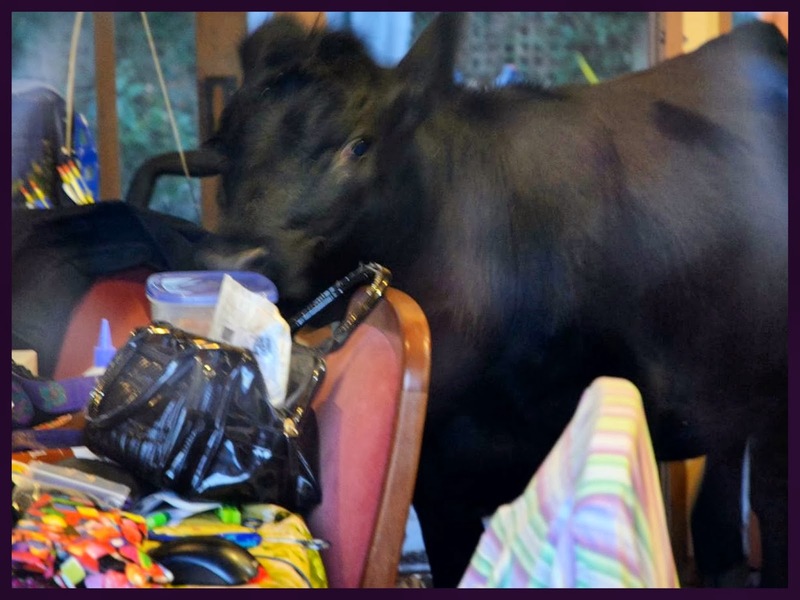 In the excitement of that bovine eviction, Oscar slipped outside and scrambled onto the table, intent on sampling some curry. Tea's curiousity was piqued by either the table, tablecloth or lion-taled cat and she advanced for a closer look. Oscar does not like Tea and has had previous run-ins with her, though generally from behind glass. I missed the crucial moment but our scrawny feline rounded on the stout bovine - while Erin and I looked on, laughing hugely! We'll be fine-tuning our emergency plan after today's practice run. Other than wallets, no-one thought to pack any important papers or jewellery. Erin did take her Disney posters and I packed freshly-baked focaccia and some apples (and well as a box of negatives - and my camera gear). On closer examination of the pic of Tea inside the house, she may well have been trying to taste-test the focaccia (or the apples)! Sneaky Tea! She has become the house cow! What a riot!! 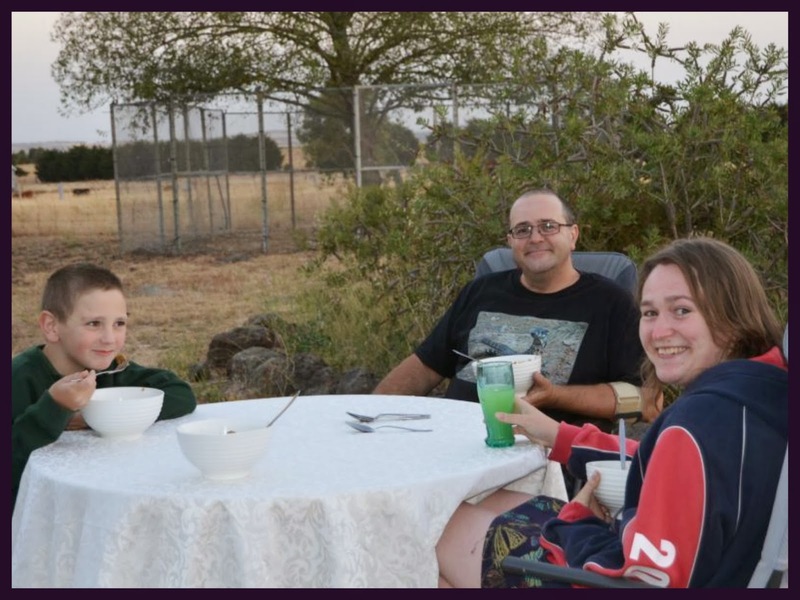 Erin thinks Tea was most probably after the apples, though the initial temptation may have been the bags of chook and calf pellets being stored inside (cos it was considered "safer" than outside)! The sliding screen door was closed, so we can add opening it to her list of milestones! (Tea's achievements not Erin's)!